Nature makes the best roller coasters. Rafting is wet, wild and exhilarating—and no two rides on a whitewater river are ever the same. Today’s upscale outfitters won’t guarantee that anyone will stay dry—or even stay in the raft—but they do promise indulgences at the end of the day. In the 1970s whitewater rafting was a macho sport. Guys in their 20s and 30s drove for hours to paddle bucking rubber rafts through scary rapids. They camped riverside, ate cold sandwiches and drove home caked in river mud because there were no facilities for miles. Over the next two decades the sport evolved. River outfitters trained guides and upgraded to self-bailing rafts, heated shower houses, campgrounds and food service—which made the sport more attractive to women and families. The industry boomed. Then Baby Boomers began to age. Here are five great rivers where rafters can have their thrills–and comfort, too. Whenever experts discuss the world’s most challenging rivers, the Gauley is always a part of the conversation. Though it’s navigable any time of year, “Gauley Season” is in the fall, when releases from the Summersville Dam create the roiling rapids on which Gauley legends are founded. The river drops 668 feet in 28 miles through 100 rapids, many of which are ranked Class V (on a scale of I to VI, the latter being an unnavigable waterfall). The New River (Ironically, the New and the Nile are the world’s oldest rivers.) flows north and eventually joins the Gauley. Along the way it passes through a deep, stunning canyon, part of the federally protected New River Gorge National River. Depending on the water flow, the New can be docile or daunting, with Class I-IV rapids. At the center of the action, the Adventures on the Gorge resort perches on the lip of the scenic valley, minutes from rafting put-ins on the New and Gauley. The AOTG’s 1,000–acre campus is home to three restaurants, a new 3,000-square-foot swimming pool, and more than 100 so-called “cabins.” These include two- to four-bedroom lodges with full kitchens, satellite TVs, wi-fi, hot tubs, fireplaces, central heat and air-conditioning, shower speakers and heated bathroom floors and towel racks. And then there’s the Paddle House–a $1,000-a-night, four-bedroom, four-and-a-half bath lodge with custom cherry cabinetry and Viking appliances—which is part of the resort’s sustainable Wild Rock enclave. AOGT has entertained celebrities such as former vice president Dan Quayle, quarterback Tony Romo, actress Jennifer Garner, golfer Phil Mickelson, musician Arlo Guthrie and former Secretary of Homeland Defense Janet Napolitano. There’s obviously no need to rough it, but “glamping” is an option for a two-day trip on the Upper and Lower Gauley. Guests overnight in the resort’s remote riverside campground, where creature comforts include hot showers, wood-fired hot tubs and platform tents with cots. A gourmet chef prepares prime rib and salmon while guests enjoy hors d’oeuvres and drinks in the open-air pavilion. The AOTG offers more than two dozen off-river activities, including Gravity–“one of the world’s coolest zip lines,” according to Travel+Leisure—and an aerial adventure park designed by Swiss mountain guides. The New England Outdoor Center (NEOC), located in Millinocket, 90 minutes from the Bangor Airport, is a luxury resort and outfitter on the Penobscot, Maine’s premier rafting river. “Rafting on the Penobscot is dam-controlled, so we have big water in July and August when the water is warmer,” says NEOC owner Matt Polstein. “Where the river flows through the Ripogenus Gorge it is one of the most technically difficult commercially rafted rivers in the Northeast. The upper West Branch Penobscot drops 120 feet a mile for the first mile and a half—a solid Class V run followed by IIIs, IVs and another Class V, The Cribworks. The NEOC has distinguished itself in the area (and earned top TripAdvisor rankings) for its lodging, River Drivers Restaurant and rafting facilities. Since 2009 Polstein has added a dozen new guest houses built to LEED (Leadership in Energy & Environmental Design) standards. Positioned on the banks of an 8,600-acre lake, each has a spectacular view of Mt. Katahdin. The three-bedroom houses have radiant heat in the floors, gas fireplaces, stainless steel appliances, satellite TV and free wi-fi. Guests have free use of canoes, kayaks, paddleboards and other outdoor gear. Also on the lake is the River Drivers Restaurant, a casually elegant setting for made-from-scratch meals using fresh local ingredients—many grown on the property. Six miles from the restaurant and guest houses is NEOC’s campground, rustic cabins and rafting center, where guests change clothes and gear up before being transported to the river. After rafting, they return to the center’s Broken Paddle Pub for refreshments and to watch videos of their trip. 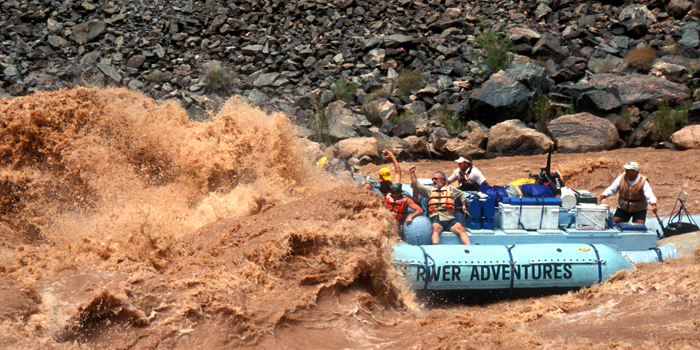 Compared to rafting elsewhere, everything about the Colorado River is big. The Grand Canyon is massive—a mile deep in places and ranging from a half-mile to 18 miles wide. The rapids are gigantic, generating 20-foot-high waves. Consequently, the rafts are huge—15 feet wide and 37 feet long. Each carries 18 rafters and guides, plus food and gear for eight nights of camping. Waterproof bags are secured in the center of the raft and riders sit along the sides with their feet propped on the massive pontoons. At the rear, a guide does the steering, aided by a 25-horsepower motor. It’s a comfortable, sun-warmed ride, even with frequent dowsings by the Colorado River which, true to its Spanish name, is often muddy red. The water is 55 degrees, so guides are quick to rescue anyone who falls overboard. The journey is epic—idyllic days of drifting past multi-hued rocks sculpted into fantastic shapes, exploring side canyons and Anasazi sites, watching bighorn sheep and other canyon critters, and cavorting under waterfalls. Night comes quickly when the sun leaves the canyon rim, but it’s cozy by the campfire and peaceful falling asleep to the river’s murmur. At the end of the journey, a helicopter whisks guests from the river to the Bar 10 Ranch, from which they are vanned to the airport. The raftable sections of the Pacuare range from Class IIs to Class IVs. The river runs through a protected 25,000-acre rainforest, so rafters see sloths, howler monkeys and rare birds—and occasionally a jaguar or ocelot. Located on the river within the protected area is the Pacuare Lodge, ranked one of the world’s Top 25 EcoLodges by National Geographic Traveler. The sustainable resort’s 19 luxury bungalows and main lodge are constructed of local materials and surrounded by rainforest. Bungalows and suites have hardwood floors, king-sized beds and al fresco showers. The wine cellar is stocked with vintages from all over the world, but the food is regionally sourced and prepared by talented local cooks. “The Pacuare is a beautiful river and has remained pristine,” says Luz Caceres, co-owner of the lodge and rafting company. “Many of our guests have not rafted before, but when they start descending the river to the lodge they begin to relax. We put a lot of attention into the experience and our guides are well-trained and attentive. The rapids are Class IIs and IIIs—a good introduction. The trip is only 90 minutes, with a stop so guests can play in a waterfall and swim in a natural pool. Though guests have the option of departing the lodge in an off-road vehicle, Caceres says 95 percent choose to raft out—about four hours through Class III and IV rapids–with a stop for a picnic lunch. Like most adventure sports, rafting takes some getting used to, especially if you’re paddling rather than being a passenger in an oar raft. No paddling skills are necessary for the motorized trip on the Colorado River. 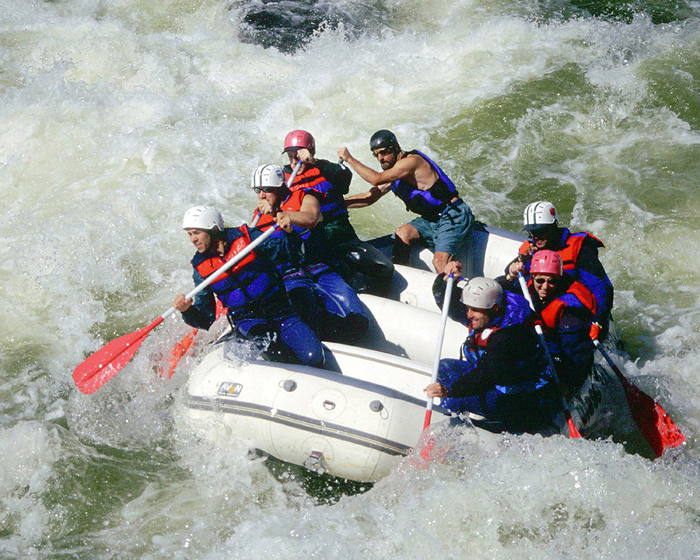 Previous rafting experience is strongly encouraged (sometimes required) before tackling the Gauley, Upper Penobscot or some parts of the Pacuare. Depending on water levels, the New River and Lower Penobscot can be good entry level rivers. Another good place to develop some skills in a great setting is the Weber River, 45 minutes from Montage Deer Valley. Over time the waterway has carved a deep canyon through red sandstone and limestone, creating striking rock formations. Guests are picked up at the Montage and driven to the outfitter’s private launch site for the two-hour trip downriver. Four to six paddlers occupy a 12-foot raft with a guide. Rafters must be at least five years old and able to swim. After rafting, guests are transported back to the launch site for lunch prepared to order by a Park City deli. During lunch the trip photographer shows images of guests running the rapids. Don’t hesitate to call the outfitter for advice on what to bring to the river. Outfitters supply life vests and helmets (if required), and offer rental wetsuits. Here’s what you’ll need to pack—or pick up at the outfitter’s shop. Wool socks and shirt for cold water or cold weather. Avoid cotton, which wicks water, but it is fine on a hot day.